Not to speak too soon, but offenses around the AAF are starting to find their rhythm. It was always going to take a while. These teams just came together not even two months ago. And in addition to the timing and chemistry that needs to be developed, the reality is not every starting 22 in Week 1 is the right starting 22. 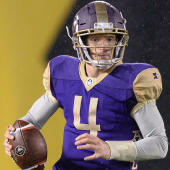 Since the AAF is a development league for the NFL, anyone watching these games has noticed one of the positions that needs the most development is quarterback. If a team has a good quarterback situation, it should be no surprise that it's winning (check out our Week 3 Power Rankings). If the quarterback situation isn't as good, the records tend to follow. That's not an attempt to over-simplify the matter, but right now points are at more of a premium than they might be in a month. No one gets you those points faster than the player who touches the ball all the time. Seeing as quarterbacks are the most watched position in the game, too, here are the five best players at that spot after three weeks. Stats are a role player in these rankings, but you'll notice it's not simply a ranking based on them. What they bring to the offense -- to the team -- is every bit as important, if not more so. Woodrum has played only one full game due to a hamstring injury that sidelined him for Week 2. He was back last Saturday in a critical 23-15 win over Arizona. Woodrum didn't have Earth-shattering stats against the Hotshots -- 178 yards at 5.74 yards per attempt, a touchdown and a pick -- but he clearly moves the offense far better than Austin Allen. Salt Lake has the benefit of a two-headed rushing monster in Joel Bouagnon and Branden Oliver, which takes the pressure off of Woodrum. Still, he's developing a nice rapport with De'Mornay Pierson-El on the outside. Unlike the others listed here, Nelson wasn't the Week 1 starter for his team. In measuring his impact, though, it's fair to say he's a big part of why the Fleet's offense has started to click. He hit two touchdown passes in a 31-11 win over San Antonio, both to Nelson Spruce, who is quickly becoming his favorite target. With Nelson in the fold, Mike Martz's offense is finally beginning to look more explosive and what we're used to seeing from his "Greatest Show on Turf" days. Perez has yet to throw a touchdown pass, but I can't ding him too much for the overall limitations of the offense. The Iron are averaging 4.3 yards per play and fewer than six yards per passing attempt while Perez has one true receiving threat in Quinton Patton. If slow and steady wins the race, Birmingham might never lose a game. However, Perez does a lot of things well. He doesn't have the strongest arm, but he makes up for it with good downfield ball placement and anticipation. He's as cerebral a player as you're going to find. He knows how to read defenses, check it down when a play isn't there and keep things moving. He is also the only quarterback to have taken every offensive snap for his team. Arizona's offense has started to sputter a bit. After scoring 38 points in Week 1, the Hotshots have scored 35 in their past two games combined. Wolford's stats are still excellent, though. He leads the AAF with seven touchdown passes and averages about 8.2 yards per attempt while completing 63 percent of his passes. He's found a nice one-two combo with Rashad Ross and Josh Huff in the vertical passing game, which still makes this offense deadly, even if inconsistent at times. His health -- he left the Week 3 loss to Salt Lake with an injury -- will be something to monitor moving forward as Trevor Knight was not able to complete passes at the same level. You were expecting whom, exactly? Not only does Gilbert have the best passing numbers in the AAF, but as he showed in last Saturday's win over Memphis, he's a capable runner when asked. Gilbert's situation works because he's under the right coach (Steve Spurrier) and has weapons around him, including Jalin Marshall and Charles Johnson. Gilbert has always had the physical traits to be a successful quarterback, he just hasn't always had the right situation to succeed. That's changed now, it seems, and Gilbert dropping dimes on the run is extremely my jam. The counterpart to Gilbert in Week 3 came off the bench and nearly led the Express to an upset over the Apollos. How and why Mettenberger wasn't starting sooner when Christian Hackenberg simply wasn't getting it done will remain a mystery -- unless, of course, Mettenberger proves why himself in Week 4, his first full game as a starter. But when you're navigating the pocket through pressure and throwing bombs on third-and-19, you must be doing something right.